But we’ve been talking about — we have Saddam Hussein, this is the Mother of All Wars we’ve got in the next 18 months. For the life or death of this country. So, I’m not going to do this to put any pressure on anyone here, mind you. This is not pressure. But if this makes your heart feel glad and you want to be more forthcoming, then so be it. I don’t know this for sure, any more than anyone else knows what that stray fragment meant. 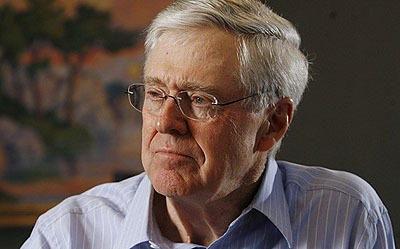 Koch obviously had some kind of quip in mind, but never managed to actually deliver it. But suggesting that he meant to compare Obama to Saddam Hussein is a stretch. At the very least, there’s at least one other quite plausible interpretation.